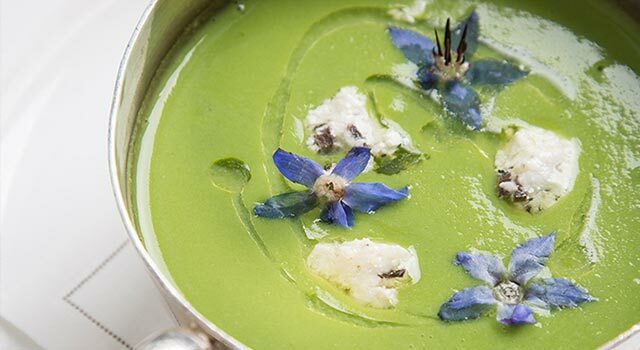 This is a wonderfully quick, luxurious, bright green soup. It feels really fresh and looks pretty with the flowers, but also packs a lot of flavour in too. Borage flowers remind me of my childhood, they used to grow in my Grandfather’s garden in Cheshire and he would decorate soups with them. I used to think I was the Fairy Princess, collecting edible flowers, baby wild strawberries and warm sun soaked tomatoes for our lunches. Using flowers in cooking has been part of my life for a long time and I still love it. Gently fry the shallots in the butter for 5-10 minutes, being careful to not colour. Add the water and bring to the boil. Then add the peas, bring to the boil again and take off the heat, drain the peas (but reserve the liquid!) and blitz until extremely fine. Then add cooking water back gradually until desired thickness. Then mix the goats curd, truffle and oil up together in a bowl. Then pour the soup into a serving bowl, add a few dollops of the goats curd, drizzle of more truffle oil and some borage flowers, then serve.